The Pontifical Institute of Liturgy (PIL) is distinctive for its method of research and the material studied. Other programs study what people say about liturgy, such as what Augustine or Thomas Aquinas says about liturgy. Students at the PIL study liturgy itself, its texts, rites, history, context and theological meaning. Once a student has learned how to conduct research into liturgy itself, then one can easily incorporate what others say about liturgy as fitting. Writing the license dissertation (license thesis) in English during the academic year due to the lighter course load. These four steps are detailed more specifically in the following. Taking these two courses during the summer will relieve the heavy course load during the first semester at the PIL. During the second two weeks of July (Block II) students may take another obligatory course or two chosen from among those offered according to a two year cycle below. Note that some of these courses are offered during Block I and the schedule is somewhat variable. The full, current list of course offerings at the Liturgy Institute London is available here. Students enrol for the first (autumn) semester at the Pontifical Liturgy Institute (PIL), fulfilling all the requirements of the PIL. This includes taking a proficiency exam in both Latin and ancient Greek and Italian because most of the courses taught at the PIL are conducted in Italian. Several courses are offered at the PIL in English by Daniel McCarthy. Taking these courses will help English speakers by reducing the burden of studies in Italian. If the course schedule at the PIL results in scheduling conflicts, it is also possible to make up some credits by taking a limited number of courses of the Faculty of Dogmatic Sacramental Theology, also located at Sant’Anselmo. During the summer between the two academic years at the PIL, students may return to the Liturgy Institute London to take several more of the courses already mentioned above, one or two courses in each the first and second block. After completing the first year of studies at the PIL, students may take one of their required research seminars in English during Block III held for two weeks in August. Each year this research seminar is offered on a different topic. By completing a seminar and its research paper during the summer, students will be relieved of this burden during the academic year when they will be able to turn to writing their thesis. Again, the full, current list of course offerings at the Liturgy Institute London is available here. In order to complete the programme of studies for the license in Sacred Liturgy at the PIL within two years, students will have to write their License dissertation (thesis) during the academic year. This is often prohibitive for many students because of the heavy course load at the PIL. However, the course load will be lighter if the student takes four courses during the summer before arriving at the PIL, and four more courses during the summer between the two academic years, and if the student takes the courses offered in English at the PIL and writes the license dissertation (thesis) in English. Students are certainly welcome to return to the Liturgy Institute London to take further courses during the summer following the second year of studies at the PIL. Some students may have the leisure to prolong their studies over another semester or academic year. Students of the PIL may write their license thesis (dissertation) in English with the English speaking faculty, including Prof. Daniel McCarthy among others. the liturgical dimensions of church art and architecture, under the heading of Liturgiam artibus provehens architectura, “Architecture with arts for liturgy”. Students who wish to write on other topics, may be directed to the faculty member who holds the chair in that field. The courses taught at the Liturgy Institute London follow the curriculum of the PIL, but are accredited by the Catholic University Leuven (KU Leuven), Belgium. Because the Belgian government subsidises the courses, the costs are low. Students enrol in each course at KU Leuven (initial enrolment form here). Upon the successful completion of each for-credit course listed above, 4 ECTS (European Credit Transfer System) credits are awarded. These 4 ECTS credits may then be transfered to the PIL, where they satisfy the requirements for each corresponding 3 credit course offered by the PIL. We are currently investigating the possibility of offering these one-hour weekly sessions in one of the colleges of Rome. More will be posted here when available. This initiative has been developed conscious of the needs of English speaking seminarians in Rome. 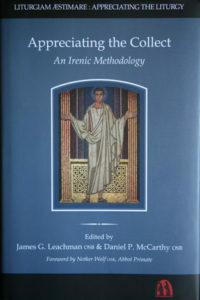 It is hoped that by reflecting on the Latin prayers of Sundays during the three years of seminary formation, followed by summer studies in liturgy at the Liturgy Institute London, and then courses taught at the PIL in English on the prayers of the liturgy, students may want to write their license thesis on the prayers of the liturgy. In this way, it is hoped, we shall build a body of people trained to pray these prayers and to reflect on them together as scholars and in their pastoral ministry.